Chill your white wines from the inside out! Immersing the chilling rod into your next bottle will instantly lower the temperature of your wine without the hassle of ice cubes and wait time. Designed specifically for wine, once our pourer is attached to the wine bottle it will create a drip-free seal that gives you absolute control of the wine flowing out of your bottle! When designing the wine chiller, we thought of the other headaches that many wine enthusiasts faced. We discovered that chilling the wine from inside out is the smartest way to remove all the hassle that accompanies wine chilling. Now, there's no need for a special container, looking for ice, disposing of water and a drenched bottle. Our elegant as well as practical pourer effectively reduces the annoying drips and spills that always trickle down the bottle! No more waiting, pull some chill sticks out of the freezer and get started! 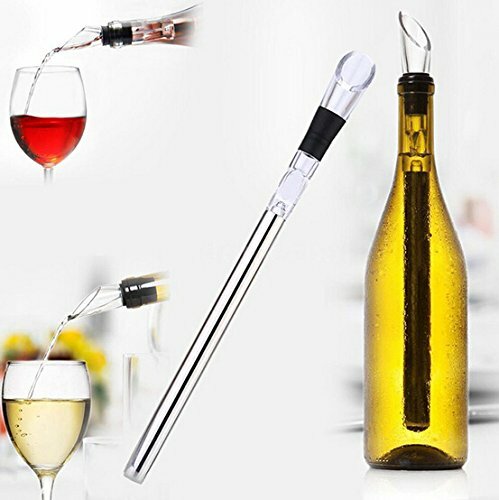 2 in 1 Wine Product: YouYah Wine Chiller Stick, a combination of wine chiller and pourer, allow you enjoy a glass of perfect chilled wine at optimal temperature. Fast and Mess-Free Chilling:The stainless steel wine chiller stick is designed to chill wine to the perfect drinking temperature at which wine bouquet and flavours unfold. Advanced Design: Drip-free pouring spout to avoid any drips or spills. Plus extra rubber stopper to keep your wine fresh. Perfect Wine Accessory: Light and portable YouYah 2-in-1 chilled stick is an absolute must for parties, gatherings, celebrations or you just want to relax. If you have any questions about this product by YouYah, contact us by completing and submitting the form below. If you are looking for a specif part number, please include it with your message.